Judy Cameron at the University of Pittsburgh studied the effect of exercise on the brains of monkeys. In her experiment some monkeys remained sedentary and others exercised for five hours per week. After 3 months the monkeys were given a neurotoxin that kills dopamine cells in the brain. As expected, the sedentary monkeys had considerable brain damage but amazingly the monkeys who had exercised showed almost no brain damage at all. The more intense the exercise, the more protection there was from the brain damage. The results continued to hold up even when the experiment was extended longer. It is not known if exercise protects our brains from damage from other poisons, but these results sure are encouraging. As part of our goal to make our unique Products and Services available to a broader population we are pleased to be able to announce our newest partnership. Dr Jim Adams joins our network of skilled and dedicated professionals, bringing our services to West Virginia. Dr Adams is located in Barboursville, WV where he has run a successful Physical and Pain Medicine practice for the past 10 years. Please call Jennifer at 1-877-773-3869 to schedule appointments with Dr Adams. Happy New Year! As we journey through new beginnings in 2010, I can think of no better way to do so than by looking at the foundational principle of recovery: Step 1 “We admitted we were powerless over alcohol/drugs– that our lives had become unmanageable” (adapted from A.A. and N.A.). The essence of the first step is surrendering the right to indulge your addiction. Although they had a different mission, the astronauts of the Apollo 11 mission had to do the same thing back in 1969. Space travel, astronauts say, is full of twists, turns, and surprises. It is filled with challenges, shock, awe, wonder, fear, and even great joy. Giving up control and surrendering to the process of space travel was essential in order to successfully get to the moon. The same can be said for the process of recovery. Everyone takes “steps” in their lives and not just the obvious ones that get you from point A to point B. From kindergarten through college, children take academic steps as they grow and improve their mental acuity into young adulthood. Entrepreneurial business ventures take many steps to go from a creative concept to the cash cow monolith that is Google. Whether educational or business, growth requires forward motion. To make the decision to quit alcohol and/or drugs is the hardest decision to make in the recovery process. But it is very doable! When President Kennedy said he wanted the U.S. to put a man on the moon, many thought he was out of his mind. You may think you are out of your own mind for trying to quit using addictive substances. Of course, that is not the truth. If you choose to take that first step, the rest is, downhill, as they say. To be sure, there will be bumps and bruises along the way, but you will have a daily reprieve from your addiction one 24 hours at a time. But, first you have to admit your powerlessness over this disease. If you’re willing to do that, then you really have taken the most important step in your life. Remember, it is one small step for yourself and one giant leap for the rest of your life! A friend of mine in AA gave me a birthday present for my 25th sobriety birthday. “What do you give someone who already has everything he needs in life?” he asked himself. His answer was a CD with an audio copy of a speech Bill W gave one night in about 1953. The talk was scheduled, and it just so happened that on that day Bob S (Dr Bob) had passed away in Akron, Ohio. So, Bill was pretty effected by the loss of his dear friend and the cofounder of AA. 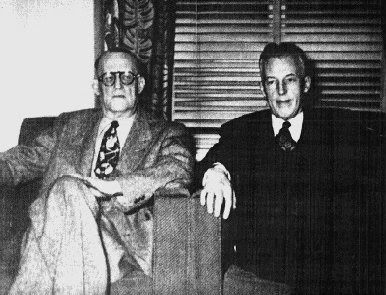 He was planning on cancelling the talk but his wife and others convinced Bill that it wasn’t about him, it was about the incredible miracles that led up to the formation of Alcoholics Anonymous. He should give the talk and focus on the formation of AA and on Dr Bob’s part in all of that. I just finished listening to the CD on a delightful drive home from Charlottesville. It was amazing. I had never heard Bill’s voice before, and many parts of his story were quite new to me. A couple of things in Bill’s talk struck me. One was just how hopeless the situation for us alcoholics was before AA started. The most experienced doctors in the country actually recommended that Bill and others like him be locked up, permanently, in mental hospitals. There was just no hope for them at the time. No other choice. Alcoholics would go in the hospital, dry out, and then get drunk again. When they drank they would run the risk of hurting other people and so it was felt that the safest thing was to keep them locked away the rest of their lives. What an amazing waste of talent and creativity that was. The second thing that struck me was the importance of the spiritual part of recovery, and the way this developed. Bill knew early on the importance of being connected with a power greater than himself, being a small part of the energy and flow of the universe. He found out early on though, that if he talked to alcoholics about God, he universally turned them away. And yet, through their experiences, the early members of AA knew just how important this spiritual aspect was. It was important to keep their egos in check. Important to be a part of the solution, to help others, to be humble and not so self absorbed. And so early on, one of the members came up with the idea of “God as you understand him” – a perfect solution to maintaining the importance of spiritual growth, and yet giving every member the opportunity to develop their own beliefs and their own relationship with their “higher power.” For me this has been one of the most important innovations that the 12 step programs have brought to us. The third thing that struck me was the importance of helping others. Bill was all alone in a hotel in Akron, and almost about to take a drink - after 6 months of sobriety. He realized that he needed to find someone else to help. Back in New York he had been trying to help others for 6 months. None of them had actually stayed sober, but Bill had stayed sober. It suddenly dawned on Bill that in actual fact Bill needed the other alcoholic more than the alcoholic needed him. The active alcoholic may not get sober, but by reaching out and genuinely trying to help him, Bill would stay sober. He just knew it. Of course what happened is that he met Dr Bob and Dr Bob did stay sober (after one slip). Together they started this organization that now measures its members in the millions. That truly is a miracle and it sure beats living in a nut house! A colleague called last week to ask about what to do with a pregnant patient who is hooked on heroin. The traditional treatment is for the women to be put onto methadone and maintained on methadone throughout the pregnancy. This treatment has been tested in clinical studies and does work. The babies are usually born a little small, and of course the baby will be born addicted to methadone and have to go through withdrawal. This usually involves having the baby stay in the hospital for a week or two after birth. In fact, most babies tolerate this very well, and don’t show too much withdrawal symptoms – although since they can’t actually talk to you, it is hard to know what they are actually experiencing. Fortunately there is now some evidence of an alternative treatment using Naltrexone implants. Drs George O’Neil, Gary Hulse, and their colleagues in Australia have published a number of articles using Naltrexone Implants. They have implants that reliably deliver 6 months or more of Naltrexone and a large number of their patients have become pregnant and delivered babies with these implants in place. The results are very encouraging. The babies are born very healthy with no birth defects. They are not born addicted to any drugs and they are considerably bigger and heavier that babies born on methadone. As we get implants that last longer in this country, and this becomes a more acceptable form of treatment I think many pregnant patients will want to take care of their addiction with Naltrexone Implants instead of methadone. Titan Pharmaceuticals have just been awarded a patent on their Buprenorphine implant – Probuphine. This is quite an exciting development. I first heard about the implant they were developing about 4 years ago. They had already done some preliminary work and were embarking on a study of patients in Australia. The idea is that the implant can deliver pretty steady doses of Buprenorphine (the active ingredient in Suboxone) over a 3 to 6 month period. By using an implant they can give a lower dose and more importantly they can stop any misuse of the drug. Already doctors all over the country are seeing quite a lot of Suboxone abuse. Patients frequently skip a few days of their Suboxone so they can get high and then get back on the Suboxone to avoid withdrawal. They often sell their doses so they can buy street Heroin – not exactly what was intended for Suboxone treatment. Probuphine may be able to avoid all of that. Of course at the end of the day the new implants contain a highly addictive drug that is very hard to detox off of. We still prefer Naltrexone Implants – they work well to decrease cravings, avoid relapse, and they have zero addiction potential. Happy New Year! As this New Year starts, I am excited about this new book I am reading. It is called Blink: the Power of Thinking without Thinking by Malcolm Gladwell. The premise of Gladwell’s book is that too often people rely upon their rational, logical, and problem-solving thinking skills to make decisions at the expense of their “intuition”, “gut feeling”, or “inner vibes”. Gladwell tells the story of a man who sold a fake statue to a prestigious museum for $10 million dollars. The museum had their “experts” check it out for authenticity and ruled that it was an original. Later on, however, some of the original experts confided in Gladwell that their initial impression was that the statue was a fake but felt that their initial impression was wrong. In other words, they over thought the obvious and made a costly mistake. Gladwell points out that had they gone with their initial impressions, the museum would not be out $10 million dollars. A very costly mistake indeed! In recovery circles, there is a common phrase given to those struggling with addiction to use when they feel tempted to use drugs and/or alcohol. It is, quite simply and ironically, “think, think, think!” It is important to understand the wisdom of this 3 word mantra. Every decision is preceded by thoughts. Every thought can influence a decision for good or for bad. The emphasis on thinking is to help the addict be aware of the dialogue that is going on in his or her head right before they use. When practiced consistently, it has been known to stop an oncoming relapse. In addition, I would add that Malcolm Gladwell’s position that paying attention to our “gut feeling” is just as useful as our logical thinking patterns. So, the next time you think about using and that little voice inside your head says, “You know where this leads. It leads to death. Don’t do it. It’s not worth it and it won’t satisfy.” Listen to that voice! Understand that, just like the statue at the museum, the drugs and alcohol on display in your life are nothing more than a fake. They will rob you blind and leave you “thinking”…what just happened?!? 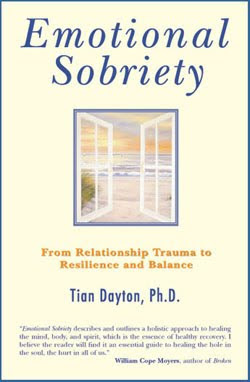 This month I would like to review a very helpful and informative book by Tian Dayton called Emotional Sobriety. As many addicts find out in early recovery, addiction is a feelings disease. It operates on rogue emotions that seem unbearable to the addict which then leads the addict to use a chemical substance to thwart the unwanted feeling. A huge part of recovery is to begin to become aware of one’s emotions at all times. Awareness is the beginning of the process that leads to right action. In Emotional Sobriety, Dayton makes the point that our emotions are the key to sobriety. Just as right action leads to right thinking, emotional self-management leads to stronger sobriety. For example, many addicts report that the emotion of boredom is a trigger to go and use their drug of choice. In the healing process, it is important for an addict to begin to recognize the signs and symptoms of boredom so they can check that situation emotionally. Instead of sitting and dwelling on the feeling of boredom, a person can engage in recovery behaviors like go to a meeting, talking with a sponsor, exercising, or engaging in prayer and meditation. This redirection of energy will relieve the boredom feelings and enhance sobriety by reinforcing to the addict the truth that uncomfortable emotions can be dealt with in self-affirming instead of self-destructive ways. This book was very hard to put down. With the turn of each page, I found myself amazed at the clarity and depth of Dayton’s writing. I really enjoyed this book because it is easy to read and very well written. Tian has packed this manuscript with detailed information on trauma, emotional growth, emotional set-backs, reframing your thinking, and so much more. Moreover, the book is compassionate in its approach towards the reality of dealing with feelings as an addict. I highly recommend this book for any addict at any point on their recovery journey. Addiction is a disease that tells you that you have no disease. Part of treating the addiction is letting yourself feel your emotions so you don’t have to anesthetize yourself into oblivion. Go ahead…get emotionally sober, you won’t regret it! Two days ago Jake shot a 10 point buck with a bow and arrow the day hunting season opened in southern Kentucky. He has met two nice girls and is trying to decide which one he likes better and wants to date. He’s playing basketball on a team and has gone back to church. He said he can’t believe how many good things are happening to him all the time now. Four months ago he was snorting 6 to 8 Oxycontin 80mg tablets a day. He could easily afford it because his job was climbing telephone poles and working on the electrical components. He made about $6000 each month and spent a whole paycheck within 2 days. He came to TCI for an Accelerated Opiate Detox 4 months ago and today I saw him for placement of his second naltrexone pellet. When I questioned him about counseling or meetings, he told me about his therapy with Deuce. Double Deuce is a Palamino filly born to his father’s stud horse when the horse was 22 years old. This was the last baby the horse would sire. Jake left his job and returned temporarily to live at the family farm --clean for the first time in several years, he took over the care of this 2 ½ year old horse. She didn’t like or trust Jake when she met him. He tried to ride her the 1st day and she threw a fit and bucked him off. He somehow knew he needed to treat this horse the way he needed to treat himself: with patience and compassion. Jake started counting off each day of his training with Deuce and each day of his own sobriety. Every day Deuce learned something new; every day Jake learned something new. Slowly, he started picking up her feet and getting her used to the idea of being shoed. Carefully he placed a plastic bag on her back and gradually worked up to a saddle. Every day he is there to feed her at 6:00 a.m. and ride her at 6:00 p.m.
She can read his emotions. He needs to bring himself completely into the present moment and meet her with a calm composure or she will react to his unsettled moods with her own anxiety and nervousness. When Jake’s father told him he’d been offered a good sum of money for the horse, Jake pled to keep her. Deuce now belongs to Jake. He has trained her for 60 days, the same number of days he has been opiate free. This sounds like a movie to me. When he told me about spotting the buck in the predawn light, arms shaking to hold the bow steady, I almost cried. It is so good to get your life back. As we close out 2009 and look forward to 2010, I would like to end with a quote that has become a favorite of mine this past year: “Adversity Introduces You to Yourself”. Let’s see what we can learn from this nugget of wisdom. Adversity is something that all of us try to avoid. From the speeding ticket, to the t-bone intersection crash, to the pink slip at work, to the “F” on our report chord, to divorce, to death …yeah, you get the point, adversity inhales vigorously! Other words for adversity include “catastrophe”, “disaster”, and “trouble”. These are not much better than the original. But can good come out of adversity? Can the adversity we face in our lives be redeemed and reborn into something beautiful? I think the answer is yes! It’s inevitable that we will all face adversity in our lives. We don’t like it. It’s not fair. It’s painful. It’s maddening. Its life on life’s terms. Unfortunate, maybe, but true nonetheless. Therefore, if we know adversity is going to come, what can we do about it? We may not be able to control the events surrounding us but we can embrace the challenge those events present to us. Musician Steven Curtis Chapman penned the following words in his song “Bring It On”, “I didn’t come lookin’ for trouble, And I don’t want to fight needlessly, But I’m not gonna hide in a bubble, If trouble comes for me.” What powerful words! Chapman assumes a laid back approach to life not needlessly stirring up trouble and is content living a peaceful existence. However, he is insistent that he will not live in a bubble if trouble comes for him. He will stand up and fight. Perhaps a better way to say it would be, “I’m not gonna hide in a bubble, WHEN trouble comes for me.” We know trouble will come; it’s just a matter of when. When we moved into our newly renovated space at The Coleman Institute, one of the fun jobs I got to do was calligraphy some phrases on the walls of the treatment rooms. Dr. Coleman chose to have the first 3 Steps from the Alcoholics Anonymous Big Book in three rooms, the Serenity Prayer in a 4th room, and a beautiful simple promise from the AA Big Book in the 5th room: We are going to know a new freedom and a new happiness. When I read this saying, I think especially about Molly, who completed a detox from heroin earlier this year. Molly was using a lot of heroin, “3 bags at a time” she continued to remind us as she fearfully went through her screening. She was quite sure we would not be able to medicate her enough to get her through her detox. She came with her mother. Their story was not unusual to us. Molly had grown up in a good loving home and had thrived in high school. She was a cheerleader and an excellent, promising student with college in her future. A few wrong choices (this won’t be a stretch for most of my readers) and at age 24 Molly was prostituting for heroin. After many attempts to help her daughter in every possible way, her mom finally had to let Molly go her own way. A year had passed with no communication between them. Molly had given birth to a son 16 months earlier. When her son was taken away from her and placed in foster care, Molly crashed. She called her mom who showed up within the day and they came here for an accelerated opiate detox and naltrexone implant. I spoke to Molly yesterday. She has immersed herself in the 12 Step Recovery process. She is devoted to earning the right to be a mother to her son. She still has occasional bouts of post acute withdrawal, but her sponsor has 24 years of recovery under her belt, and is helping her avoid the landmines. Molly is beautiful on the inside and outside. I am hoping on one of her visits from upstate NY, she’ll bring her son, who has her green eyes and long lashes. She is truly on her way to manifesting the promise of “a new freedom and a new happiness”.